Solid wood: Made from maple, oak, and pine. 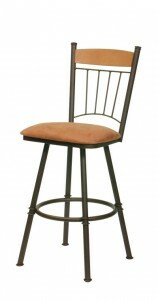 These locally made to order stools come in a range of stain finishes. The chair seats can either be made in solid wood, or upholstered in a wide selection of fabrics. Upholstered on a welded steel frame: These durable stools are available with a variety of low VOC powder coated finishes, and also brushed steel for a sleek modern look. Leather: Upholstered in Bycast Leather, with a Malaysian hardwood frame, these are both stylish and affordable.